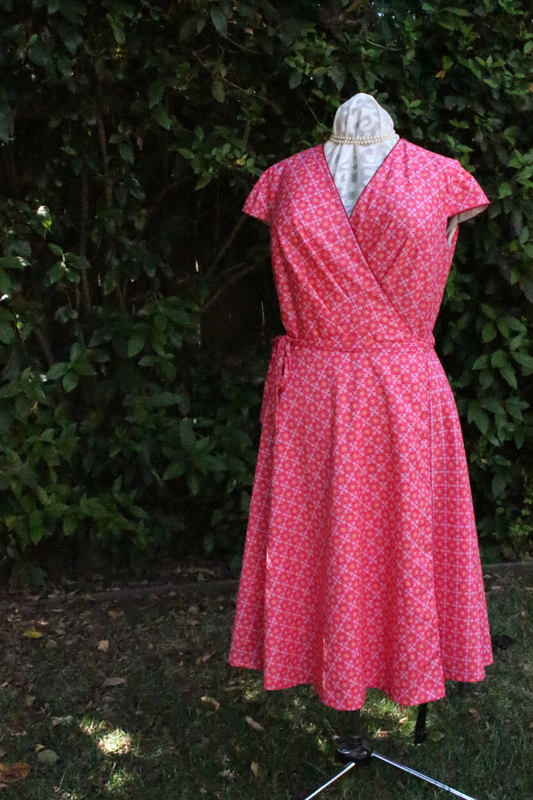 Last week, I finished the coral Vogue 8784 wrap dress that I started LAST FALL. 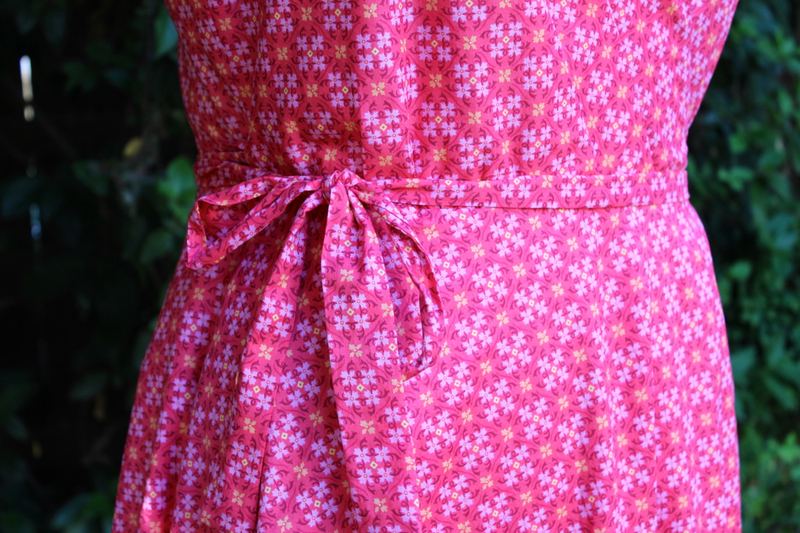 This is the first wrap dress I’ve ever made, and it’s a pretty amazing thing, really. Yes, wrap dresses do seem to be pretty flattering, as people say. But this one is also pretty forgiving. Vogue 8784 on Gene the Dress Form. When I started it last fall, I weighed 20 pounds less than I do right now. From the beginning of November through the end of February, I suddenly gained weight. I didn’t eat any differently or exercise any less (because, well, there isn’t any less). I’m blaming hormones for changing my metabolism (I entered my late 40s this week), but I’m fighting back with an increase in biking and a decrease in sugary baked goods. We’ll see how that goes. Anyway, the dress still fits because of the generous self-tie closure that wraps completely around the waist and ties at the right front. (There is no choice as to where it ties.) I was prepared to sew in a snap at the V-neck where the two fronts cross, but it doesn’t seem to need it. This tie is the only closure. With a generous front overlap, it makes this dress very forgiving of changes in weight. Also, I didn’t realize this little bonus until I was half-way through sewing the dress, but it doesn’t call for interfacing. Whoo-hoo! Construction requires a full lining, so the interfacing isn’t needed. 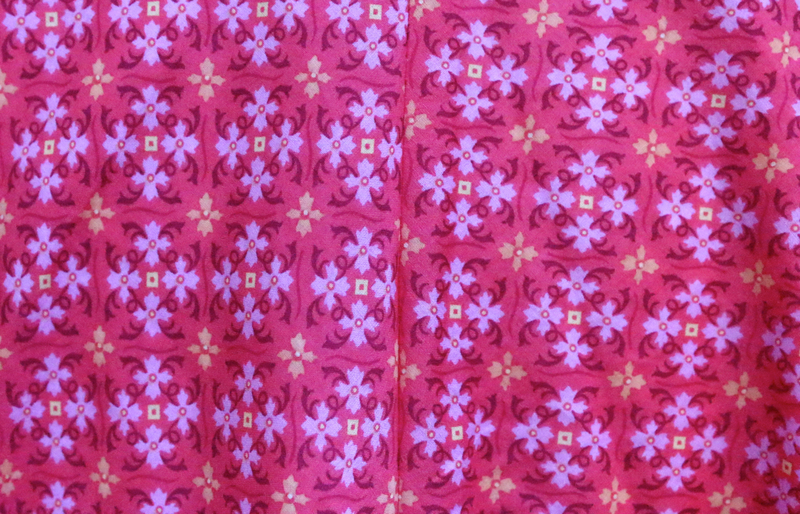 I also added prepackaged piping along the neckline down to the front edge of the skirt. That stabilized that entire edge, so I could dispense with the topstitching that was called for there. It also made the wrap style more noticeable despite the busy pattern. The piping makes the wrap structure easier to see. To fit my figure — well, the one I had last fall anyway — I made my usual pattern alterations: full-bust adjustment, lowering the bust point, and lengthening the entire bodice half an inch. I also lengthened the skirt a few inches. That just-below-the-knee length makes the legs look good but is overall out of proportion on me. I couldn’t bring myself to abandon my sewing pride and do the machine hem called for in the instructions. 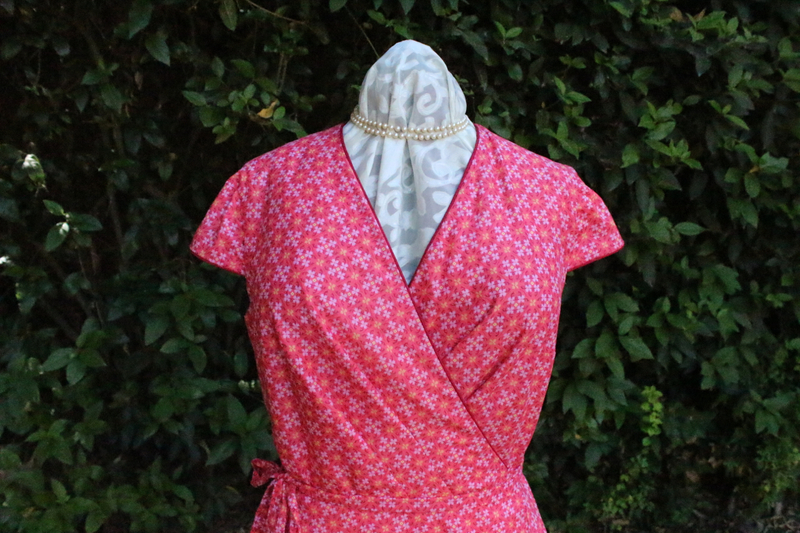 I used rayon seam binding as a hem tape and sewed both the dress and lining hems by hand, which — along with hand sewing the lining at the waist seam — took forever. Forever being two Giants games and one viewing of The Mummy Returns. I sewed the fashion fabric hem and the lining hem by hand with a catch stitch. I’m very happy with my new dress, but as is always the case with sewing, the project had its self-inflicted challenges. In making the full-bust adjustment, I forgot to create the waist dart. That made the bodice front too wide to fit the skirt front. I fixed it by easing the bodice using the basting stitch that was holding the bodice and lining together at the waist seam. With the busy print, the easing isn’t noticeable. I think this is a pretty legit way to eliminate a waist dart. I misread my own adjustment for the side seam dart when marking one bodice front piece, so the darts start at different spots in the side seam. They end at the same point, however. I made them both correctly in the lining just because it made me feel less lame. I didn’t read the pattern instructions closely enough to notice until it was too late that the bodice lining is sewn in differently depending on which sleeve style is used. I ended up having to hand sew the lining to the bodice at the armscye. I was very diligent about marking the wrong sides of the fabric and the lining for the unusual diagonal pleats. This was a total waste of time. The pleats are made after the bodice lining is in place — that is, when the wrong sides are no longer visible. Curses! Next time, I’ll mark the pleats on the right side of the lining. I’ve already made a note in the pattern instructions. I was a little sloppy putting in the cap sleeve. It doesn’t even go completely around the armscye, and it still has accidental tucks. That’s just amateur night. I didn’t pay close enough attention to my thread and bobbin color choices. 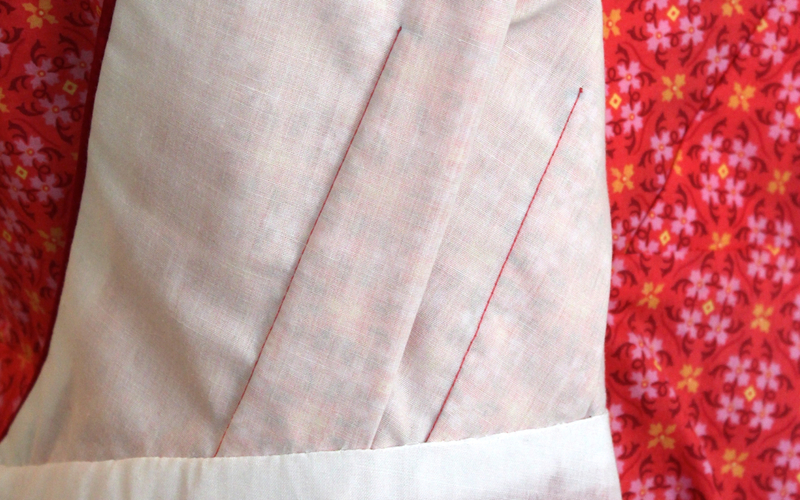 If I had, I wouldn’t have ended up with coral thread showing on the white lining at the pleats. That was so easy to avoid with a little forethought. See the coral thread on the white lining? Well, how could you miss it? With a little advance planning, this could have been avoided. 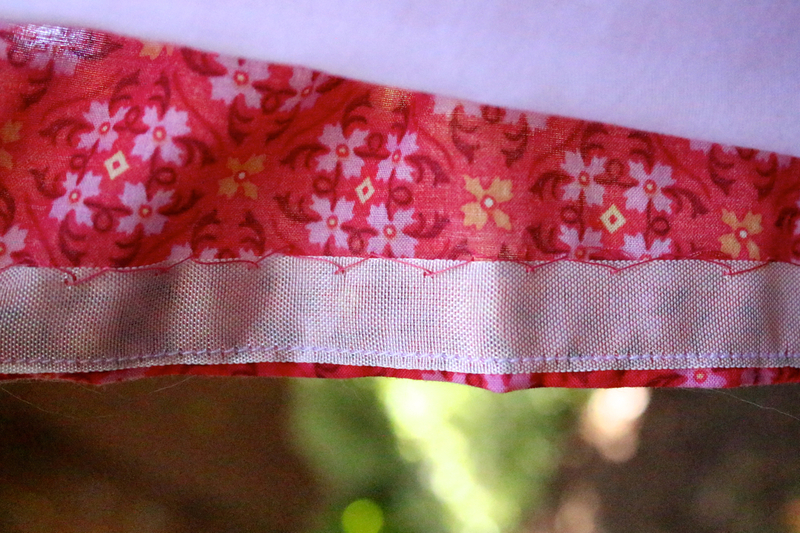 Lengthening the skirt meant ending up with a wider hem that wouldn’t fit on the fabric per the pattern layout. I had to get a little creative there. I was also a little lackadaisical with my pattern matching at the back skirt seam (as in I didn’t bother with it at all). And the diagonal nature of the print combined with a V neck and diagonal pleats makes for some weird angles here and there. Total lack of pattern matching! That’s just laziness. I was right that I had enough white fabric in my stash for the lining. But I didn’t have enough of any single white fabric. Most of the lining is poly-cotton batiste. The remainder is a heavier cotton sateen. This pattern came together nicely, and even with my flubs it makes me happy-happy. Color blocking with a white top, navy skirt, and red tie. Making the bodice and tie in chambray with white topstitching and the skirt in a cream-colored lace. Making the dress in eyelet with a color lining and matching tie. Making the dress a solid color with embroidery detail along the neck edge and skirt front edge. And by embroidery, I of course mean machine embroidery. I need to get out that cute little Brother PE 700ii that’s been hiding under its dust cover for a while now. Adding a stand up Mandarin-type collar, switching to different sleeves, and widening the waist tie. And with the style being so flexible as to accommodate fluctuating weight, I can definitely see making a few more. I’m planning to wear the dress when my husband and I go for an anniversary brunch this Sunday. On D-Day, we will have been married for 21 years. I’ll see about taking a photo then. As of this writing, the San Francisco Giants are not only in first place in the National League West, they also have the best record in baseball. This makes for a happy Casa Tokunaga. Thank you for sharing. I love your dress and your workmanship is terrific. You must have a lot of patience to do so much hand sewing. I must say I’m seriously considering your hemming stitch for a future project. Thank you! The catch stitch is pretty new to me, but I really like it. It’s sturdy without being too tight. Gorgeous dress! I cringed at the hand sewing since I’m so lazy. But it looks amazing, of course. Thanks! It really helps me to have something on TV I don’t need to pay that much attention to while I’m hand sewing. Beautiful … Thank you for these helpful post-mortem type posts. It helps a newbie like me to catch things before I screw up and don’t know how to fix it! You are so welcome. I learn from others’ mistakes, so I’m happy to share my own!